established for past ten years, just like the the US internet did so. The infrastructure of communication and broadcasting has been established in one category as a result of a highly-developed optic fiber communication network influenced by broadband internet and a digitized broadcasting field with widely used digital television. An unified infrastructure of communication and digitalized broadcasting begins to create new business opportunities, such as an unification and interface of media business. The broadband internet allows to stream various digital information, such as music and videos, which go beyond digitalized text and photos. Moreover, it has revolutionized a distribution system in a digital contents business field. A new era of venture business will be expected to arrive. For next 10 years, interesting venture companies, which are based on the world most developed communication infrastructure, will be established in the broadband・internet field. It has been ten years since the Bit Valley period (Tokyo internet prosperity period ( College students and young businessmen in traditional large corporation entered internet business in the period.) . A group of human capitals now in their 30s with ten years of rich experiences in the venture business management would support this new era. We pursue innovations, which is possible to develop from Japan to the world, by way of broadening business to the medical and healthcare business to cater to the needs of world fast growing elderly society and the environmental and ecology business in the main stream of ecological community, which symbolizes with a Japanese word, Mottainai (No waste). 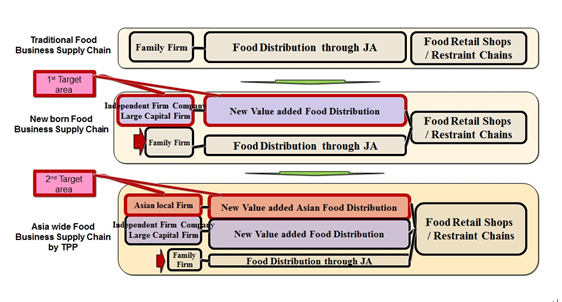 SIP thinks that ventures in supply chain from Agriculture to Food business is the growing venturesome market which will blossom as a cluster of ventures through hands-on venture capital investment method, then regards as strategic investment area. US Venture Capital industry created new great amount of risk money system by making pension fund LP investors of Venture Capital Fund. Based on the abundant risk money, VC funds targeted into personal computer and internet business areas, which made direct sales channel to the consumers and new influential media in combine together, and enabled great high growth period in 1990s. In 21 century, centre of the growth market is the ones of emerging countries, such as BRICs, especially China. In these countries, food business area is the one of most potential growth area because wealthy consumers want safe and delicious food in any such countries. To supply the food products, the supplier compete against each other and innovate new services and systems in the global economy by TPP. To grow up ventures in agriculture and food business area in the global competitive framework, risk money through venture capital funds and hands-on capability by VC firms are necessary. SIP regards agriculture and food area as strategic investment area, and supports Japanese agriculture ventures to become global successful ventures.